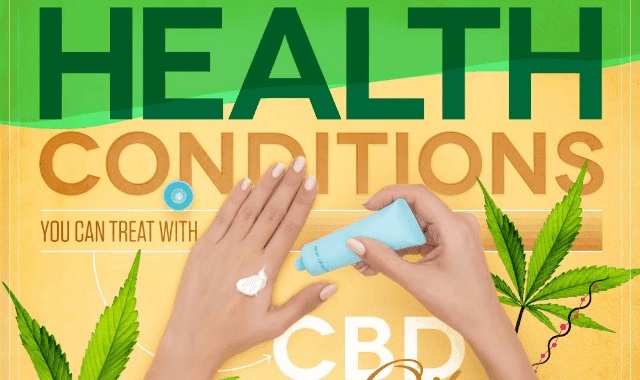 Health Conditions You Can Treat With CBD Oil #Infographic ~ Visualistan '+g+"
CBD, or Cannabidiol, is a non-psychoactive compound derived from the famous marijuana plant. Though its origins may leave some scratching their heads, the effects that CBD supplements offer certain individuals cannot be ignored. Reacting directly with the body’s serotonin receptors, CBD has the potential to treat a huge variety of symptoms and conditions all the way from anxiety/depression, chronic pain, and even offers relief for cancer patients. Cannabidiol has been shown to alleviate feelings of nausea and vomiting, especially in situations where traditional treatments come up short. In individuals who suffer from minor motion sickness, chronic vertigo, and even chemotherapy related nausea, CBD has shown to treat these symptoms effectively and safely. Those living with sleep disorders, some of the most misunderstood and mysterious conditions in the medical community, have also reported improved sleeping patterns and habits after using CBD. Considering trying CBD supplements for your own symptoms or conditions? Take a look at this infographic for more on the uses, science, and politics behind CBD.